There is a lesson to us in these words. God does not want us to be an obstacle to our children being brought to him or finding him. Just as we are responsible for nurturing the physical wellbeing of our children, so too, are we are responsible for nurturing the wellbeing of their souls. There are many ways that this can happen. We can introduce them early on to the idea that there is a loving God who created us and all that exists. He humbled himself to become one of us, and gave his life for us in order to save us from eternal death and destruction. Then he sent his Holy Spirit to be with us and give us wisdom, knowledge, and strength to cope with a hostile world. It is a long term process that takes perseverance in guidance and instruction as well as the example of our own lives – perhaps the most difficult aspect of parenting. Young children are great imitators. They imitate what they see their parents doing. I had a good friend who has passed on from this life. He was a good and righteous man who was active in prison ministry and a ministry to the workplace in which we were both involved. I always remember a story he shared that had so much influence on his life. He said that when he was a young boy and would come downstairs in the morning he would find his father on his knees praying in their living room. He said it had a huge impact on him throughout his life, something he always remembered when he started to get off track. As our children move from childhood through the teen years and into adulthood, there are many minefields facing their journey, particularly in today’s culture. It is important as parents that we instruct them when we have the opportunity, correct them when there is wrongdoing and provide loving guidance and prayer as the need and opportunity arise. We certainly don’t want to “hinder them” as Jesus invites and draws them near. This entry was posted in Uncategorized on February 19, 2019 by Bill Dalgetty. After sharing the parable of the shrewd manager, Jesus offers a number of comments about money and wealth, and suggests that there is a correlation between good stewardship of worldly wealth and the true riches available to us from God’s Spirit. If we are careless with worldly things and wealth, why should God trust us with the true riches of faith in him and his presence through the gifts and fruit of his Holy Spirit? Jesus said, “Whoever can be trusted with very little can be trusted with much, and whoever is dishonest with very little will also be dishonest with much.” (Luke 16:10) Some examples come to mind such as taking advantage of a sales clerk’s mistake of giving back too much change; overestimating mileage for personal use of a car for reimbursement on an expense account; helping yourself to office supplies for personal use. How strong is our integrity if we can’t be trusted with taking ownership of small things that don’t belong to us? Petty theft erodes our integrity and faithfulness to truth in both our actions and beliefs. It dulls our sense of goodness and justice and how we relate with others, for the focus is inward on ourselves instead of outward on God and others. Like a distant black hole in the universe we keep the light that Christ offers from shining outward. This self-focus is an obstacle to our truly experiencing God in a personal, close way through his son Jesus Christ and the Holy Spirit. To all of this, Jesus adds the admonition that “No servant can serve two masters. Either he will hate the one and love the other, or he will be devoted to one and despise the other. You cannot serve both God and money.” (Luke 16:13) While God expects us to work in order to take care of ourselves and his creation, he does not want this to become our principal focus to the exclusion of our love and pursuit of him. Success in the workplace, moving up the corporate ladder and earning more money are not bad in themselves, but they should not be our primary focus. Our first priority should be to love God and seek his will in all things. I have written in these pages before how my focus as young attorney for a large corporation got out of whack early in my career, detracting both from my relationship with God and my family. Fortunately by God’s loving grace and a personal encounter with Jesus, he opened my eyes to what was happening and helped me to change my priorities. This entry was posted in Uncategorized on February 12, 2019 by Bill Dalgetty. From all of this, we see that Jesus wants to stay connected to us, as a vine is connected to a branch, and live in us by the power of the Holy Spirit so that we will bear the fruit of the Holy Spirit in our lives. I have a friend who teaches Ancient History to middle school boys at a Blue Ribbon Christian school. He also serves as the property manager for the school and the administrator for a Christian community that supports the school. His life reflects a veritable market of the fruit of the Holy Spirit. In his many and varied responsibilities he treats all people, regardless of who they are, with kindness and respect – students, parents, fellow teachers, repairmen, and all who come to him requesting his help on various matters. You can find him on campus humbly fixing a toilet in one of the school’s buildings, as well as taking time after class with a student needing extra help on a homework assignment. In contrast to most of our society today, he and his wife took in his elderly parents when they could no longer care for themselves, including his father whose remaining years were burdened with advanced Alzheimer’s. Early in their marriage they lost an infant son. In the course all of these challenges he has maintained a bright smile, a lively sense of humor and the joy of the Lord. This entry was posted in Uncategorized on February 5, 2019 by Bill Dalgetty. Jesus is talking to his disciples about the importance of a servant being watchful and found doing what is expected of him when his master returns. He says the more responsibility that is given to you, the more that will be expected of you. This is about our accountability to God for the life, time, talents, responsibilities, and resources he has given to us. As in the parable of the talents, the master’s servants were expected to multiply the money that was entrusted to their care, not simply preserve it. I have a friend whose son has been a high school choral director. He has a unique ability to get the best of music out of whatever musical group he is directing, either choral or orchestral. He is now taking graduate work to hone the talents God has given him. I have no doubt that someday he will be the conductor of a major philharmonic orchestra or choral group. As a father of five adult children, it is blessing to see each of them use gifts that God has given them in addition to caring for their respective spouses and children. To one has been given the gift of mercy and love which she uses to volunteer for numerous needs in her church and community. To another has been given a way to teach history and make it come alive for her students. To another has been given the compassion and understanding to oversee an inclusion program in a Catholic high school for students with intellectual disabilities. To another, after working in software development for several years has discovered, along with his wife, their special gift to capture unique images of marriage in a new photography business. To our youngest daughter born with Down syndrome, God has given the gifts of purity of heart and love, and a special memory for dates, for which she reminds us of the birthdays of every member of our family, including her thirteen nephews and nieces. What’s important is not what gifts God has given to each of us, but that we are fully using the gifts he has entrusted to us for his purpose. Being retired these last several years, God has given me the gift of time. How am I using this gift? When you are older, you have to fight the lie that you are limited in what you can do and that no one wants to listen to you anymore. However, the needs for volunteers are almost endless. So, I have chosen a few things that are an in keeping with my past experience in work and ministry. As they say in the old western movies, I hope to die with my boots on. This entry was posted in Uncategorized on January 29, 2019 by Bill Dalgetty. We may recall the story of Joseph, the next youngest son of Jacob in the Old Testament. Out of jealousy, his older brothers sold him into slavery to some merchants traveling to Egypt. The merchants sold him to Potiphar, the captain of the guard for Pharaoh. Potiphar put Joseph in jail based on the false accusations by Potiphar’s wife. Later, Pharaoh had a dream that no one could interpret. His chief cupbearer remembers that Joseph had correctly interpreted a dream for him while he was in prison. One of the great aspects of God’s love for us is that we can hope in him even in bad situations. Like the story of Joseph being sold into slavery and imprisoned for several years, God can redeem bad things in order to serve his larger purpose and will. The following story is an example. Bob and Steve owned competitive insurance brokerages. 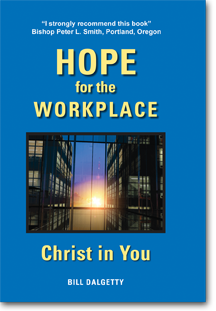 Bob was practicing his Christian faith in all the areas of his life, including the workplace. Steve was not, which made competing against Steve challenging. Both Bob and Steve were in their prime when Steve was convicted of a white-collar crime and sent to prison. Even though Steve was no longer a threat to Bob, he sensed the Lord asking him to visit Steve in prison. Bob’s first reaction was, “No Way! Why should I be compassionate and forgiving to this man?” The Lord’s prompting continued though. So, Bob was obedient to the Lord’s request. When Bob walked into the visitor’s area, Steve was shocked. Tears started to well up in his eyes. Steve couldn’t believe that someone he had attempted to take business from would want anything to do with him. Bob prayed with Steve, gave him a Bible and encouraged him to embrace an intimate relationship with Jesus. When Steve was released from prison, Bob was there again to help him get back on his feet. Steve’s mistake cost him his marriage, access to his children, two homes, all his possessions and the majority of his friends. As part of Bob’s continued commitment, he took Steve on a Christians in Commerce retreat. That retreat transformed Steve, introduced him to daily prayer, accountability with other Christian men and encouraged him to become the man God had created him to be. Steve died earlier this month of cancer, with his former wife and children at his side. He had repaid all those who lost money through his prior actions. He regained his personal and business integrity, was president of the local chapter of Christians in Commerce, and became a powerful witness for Jesus Christ and his redeeming acts of love. God took a bad situation and led Bob to forgiveness and Steve to new life – consequences that neither of them would have anticipated. This entry was posted in Uncategorized on January 22, 2019 by Bill Dalgetty. Sometimes we are confronted with circumstances we do not understand, but have to live with or accept them on faith. Mary and Joseph had that experience when they lost track of Jesus’ whereabouts as they were returning to Nazareth from Jerusalem for the Feast of the Passover. Jesus, who was twelve years old, stayed behind in Jerusalem while Joseph and Mary thought he was in their company with other relatives. We might ask why they didn’t understand what the boy Jesus was saying to them. Both Mary and Joseph were told by angels that what was conceived in her was from the Holy Spirit, and Mary was told that the child would be called the Son of God. Elizabeth asked, “Why am I so favored that the mother of my Lord should come to me?” The Shepherds told them that angels had said the child would be the Messiah. They saw the Magi worship their baby and give him gifts. They saw Simeon take the child in his arms and declare that he had now seen the salvation of the Lord. Perhaps it was because it had been twelve years since all of these things had happened and Jesus had just become another normal young Jewish boy growing up in their midst. Last June I booked a cruise for my wife and me that would have begun this week. Since our daughter Emily is disabled, one of our other daughters who live in North Carolina agreed to leave her family for two weeks and come to assist with Emily while we were gone. After booking the cruise, I started to get an uneasy feeling about it. About a month later, a couple of things happened that added to my uneasiness. The cruise line changed our flight arrangements and advised that certain tours that we selected were no longer available. I began to pray, asking the Lord whether we should continue with our plans. I didn’t understand why I had these negative feelings, but after further prayer and discernment, I decided to cancel the cruise. Last week the father-in-law of our daughter who was going to look after Emily died. His burial is today. Furthermore, her husband who was going to look after their children while our daughter was looking after Emily has to leave tomorrow for a business trip to London. We might have been able to manage all of this, but it would have been very difficult for our daughter and her family. It would have also created considerable anxiety for them and us. My wife and I believe that the Holy Spirit was prompting me not to proceed with our planned cruise. I didn’t understand the reasons, but I acted on the prompting, and my daughter, her husband and their family were able to celebrate the life of his father without an obligation to us hanging over their heads. As an added bonus, I was able to fly to Colorado and attend the funeral of my son-in-law’s father – a man cherished and loved by his family and friends. This entry was posted in Uncategorized on January 15, 2019 by Bill Dalgetty. We have just celebrated God becoming one of us in the birth of Jesus, one of the greatest acts of humility and love in all of history. Yet in the world around us one year comes to a close and a new one begins full of conflict and strife, much like they have for centuries. Wars continue in Syria, Yemen and Afghanistan. Incidents of terror and mass shootings take place in our own country and abroad. The church is rocked with a sexual abuse scandal. Identity politics and political agendas are tearing apart the very fabric of our nation’s traditions and moral values. The first chapter of John’s Gospel offers both a realistic context for what we have just celebrated and a hope that can carry us through the new year. We will not read about it in the news media. Speaking of Jesus, John says, “He was in the world, and though the world was made through him, the world did not recognize him.” Not a single governmental or spiritual leader in Israel took note of Jesus’ birth. Only a few lowly shepherds were his herald. In fact Israel’s king actually wanted to kill Jesus, not unlike some authoritarian regimes in our day. “He came unto his own, but his own did not receive him.” Even before Jesus was born, he was rejected by the innkeeper who had no room for him. As Jesus later revealed his presence and identity, the religious leaders of his day also rejected him and even sought his death. This entry was posted in Uncategorized on January 1, 2019 by Bill Dalgetty.